If you've been following the Windows 8 tablet PC market, you'll know that most of the current Windows 8 slate tablet PCs have a 10" screen size. Then Acer announced the Iconia W3, an 8" Windows 8 tablet to compete against smaller mobile tablets like the iPad mini and the Google Nexus 7 (by Asus) running Android. It's nice to be able to hold a smaller, thinner tablet in one hand. 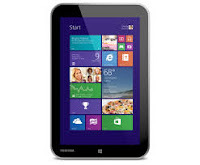 Toshiba has announced the Encore - an 8" tablet running Windows 8.1 powered by Intel's Bay Trail processor (the latest generation Atom processor featuring quad-core performance and even longer battery life). Intel Bay Trail is the successor of the Intel Atom processors named Clover Trail which are powering some of the current Windows 8 tablet PCs. Clover Trail has very long battery life, but overall system performance is slow compared to the ultra-fast (but more battery-draining) Intel i3, i5, i7 Core processors. The next generation of the Intel Core processor is called Haswell and it's supposed to delivery very fast performance along with very long battery life. Intel Bay Trail is supposed to deliver the same: fast performance with even longer battery life. So, it sounds like the performance/battery life lines separating the performance between Bay Trail (Atom) vs. Haswell (Core) may be getting blurred. But, the key distinction here is that tablet PCs powered by Bay Trail will also have the ability to run the Android OS if the manufacturer chooses that capability. So, perhaps the future of many Windows 8.1 tablets will also include a dual-booting option with Google Android. Speaking of Windows 8.1, you can preview an early version of Windows 8.1 (not the final version) by downloading and installing Windows 8.1 Preview (windows.microsoft.com/en-us/windows-8/preview‎). Or, you can wait for the final version of Windows 8.1 which is getting released on October 17.